I always like reading about everyone’s favourites and non-favourite rides and attractions in the enthusiast world. There are so many different variety of opinions, that is what makes this community so interesting. So, as I have already provided my top 10 list, and my bucket list rides/coasters, I thought I would start writing about dark rides. Moreover, the dark rides that I consider to be my ‘Top Dark Rides’. Now, as I started writing this list, I was going to write a simple list of dark rides I have ridden in my lifetime so far, both past and present, and including Europe and Florida. Well, I didn’t quite anticipate the amount of dark rides I have ridden and how many I loved so much that they need to be included in this list. So I will be splitting this list into THREE blog posts. Yep, 3. So, let’s crack on with ‘part 1’ of my list, My Top UK Dark Rides. I don’t think I know of anyone who doesn’t have a soft spot for Hex. It all begins as soon as you walk inside the queueline. The creepy darkness of the Towers adds to the atmosphere, as you are told the brief story of ‘The Legend of the Towers’ and what is to come. The narrative and story are pretty much a clever take on what is a true tale – ever visited the Chained Oak Tree? The ride hardware is disorientating to those unknown about the workings of the ride, but the theming inside is beautifully creative and can we just take a moment to appreciate THAT soundtrack. The haunting violins and orchestral theme – gives me Goosebumps every time I ride. Now where can you find a ride that is quintessentially British and colourful… Any true Brit will know the stories of Wallace and Gromit – if you haven’t, who even are you? 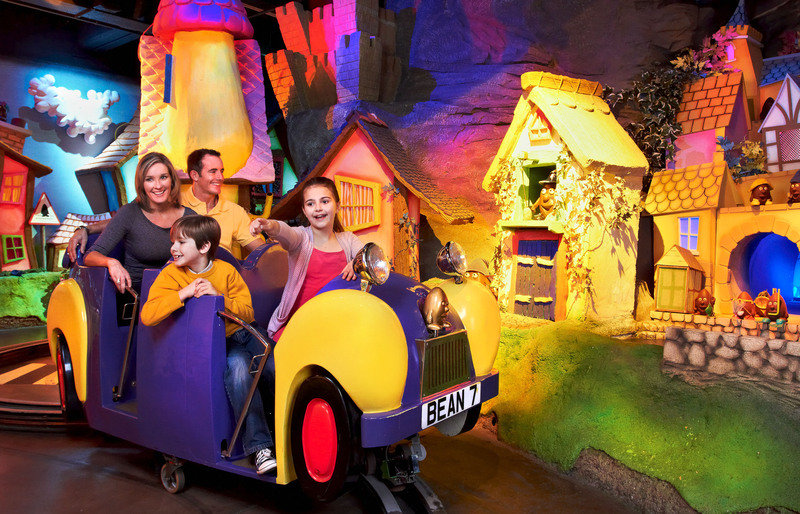 – and now there is a beautifully crafted dark ride at Blackpool that depicts all the various stories for you. From Wallace’s wrong trousers to travelling to the Moon made of Cheese! ‘Cheese Gromit!’ And do you want to know the absolute best part of this ride? You get to ride along in a giant slipper!! The fact this ride is located at Blackpool, it is just perfect for the ride line-up. It has that re-rideability where you won’t ever tire of being on it. Yes, I did touch upon this in my Favourite Water Rides blog post but technically, it is not your traditional dark ride. There is no denying how totally awesome this ride is. Even if the wetness levels are so ridiculous, it shouldn’t be in a place such as Blackpool. Sorry Mandy! I seriously want to know what the creator of this ride was smoking when they designed this. It is completely insane with the effects, say hello to water and fire! This ride is a great water ride – and literally has every opportunity to soak you through and through. The theming just takes this ride from being a bog-standard water ride indoors to one hell of a experience. The soundtrack is truly captivating, and you won’t forget it in a hurry. Yes, I love this ride for the theatrical elements but when it comes to the wetness levels – it needs to be a damn hot day for me to warrant a ride on it. Or if I’m well prepared with several ponchos, boots/wellies and clothes I don’t mind getting drenched in. I don’t know if some people forget about the existence of this dark ride, but it needs to be added to my list. Yes, it is almost like a ride that you would find at one of your typical Disney parks – an omnimover with insane amount of theming and use of space – it’s bloody huge. It is a sizeable attraction that gives you the story of London so it’s perfect as an educational ride for the family/kids. If there is one thing you should not miss when visiting Madame Tussauds, it’s Spirit of London. I must say, I was very nervous when it was announced that Gruffalo would be taking over from Bubbleworks. Not to say that a retheme was needed, I totally agree, it was very much needed. But using an IP, it’s a risky business in my opinion. However, I must say I was thoroughly impressed with this transformation. The theming was very well executed within the budgets that Chessington received, and I love the interaction the elements have with the ride. Kids adore this ride, just by simply watching their reaction once they’ve come off the ride! The smells, the soundtrack and sound effects throughout the ride tell the story of the Gruffalo really well, and this why I had to add it to my list. I had to add this to my list. It is by means not a world class dark ride attraction, but I just love the ride being a part of a chocolate factory tour. The ‘Beanmobile’, yes that is what it is called, takes you on a ‘gentle ride through a chocolate wonderland full of familiar characters’. It’s quaint, has all the famous characters known to Cadbury’s and a simple dark ride that should be ridden at least once on your trip to Cadbury World. I remember being haunted by this ride as a child. The entrance to the ride was insane with a massive witch animatronic looking down at guests as you walk into the ride queue. As a small kid, this was terrifying. That, once you entered the ride station that was dimly lit, the darkness just added to the creepy atmosphere. Unfortunately, I do not have many memories of this ride but from what I can remember, this was a true 90s style attraction that had that creepy-factor. I only had one go on this dark ride at Pleasurewood Hills back in 2013. I can tell you now, it was a damn good attraction. If you loved all things spooky and scary, this was the attraction for you. It was totally unexpected for a park such as Pleasurewood Hills, that I would describe as a ‘cute little family theme park’. The ride had live actors throughout the ride and having experienced a few ghost trains with live actors, this was like a scare maze mixed with a ride. It was gory and graphic at times – no wonder it had an age-restriction! Such a shame it closed! Where do I even begin with this? The crazy storyline, Abdab turning into a zombie/mummy, the ‘Juke Box Jewel’ finale, the darkness inside the ride. Yep, I don’t know why but I just have a flurry of memories of me wondering what the hell this ride was about whilst being terrorised by the scary characters! It isn’t an omnimover by any means but it didn’t need to be. You were immersed in the ride as soon as you entered the queueline, and once on the ride, you were on the journey with Abdab. Seriously, I wish this ride lasted so much longer than it did – why did it have to become an interactive dark ride? Whyyyyyy! One thing you can be certain of, Chessington liked their crazy themes back in the day. The Sparks Group did a completely fab job bringing creativity to life, which is where Professor Burp’s Bubbleworks comes in. It was a lighthearted attraction that not only smelt absolutely amazing but it was bright pink. Within the Transylvania area, you had a ‘scary’ rollercoaster themed to Vampires yet within this same area was a bright and colourful ‘Pop Factory’, run by a mad professor! It was crazy, it was fun, it was everything you needed for a family attraction. As you float into the different areas in the ‘factory’, once again, it was a truly immersive dark ride. And let’s not forget about the fabulous fountain finale with the strobe lights – disorientating yet fantastic! I want to say this is just a few dark rides, but I seem to have rambled on for ages! You cannot beat a good quality dark ride at a theme park – sometimes you need to remember and appreciate what is available right on your doorstep. Even though we may get spoilt by fantastic quality dark rides abroad, we have to give some love to our dark rides here in the UK.